* Parking is $15 on event day. * Due to rules and regulations, beer will not be served on Sunday until 12:00 PM. * Must be at least 14 years old by the day of the event to participate in the course. The Competitive Wave will be at 8:20 am on Saturday, April 1st, 2017. There are no qualifications needed to register for a cash prize waves. However, we do recommend that only serious competitors register for the Competitive Wave. The Competitive Wave is limited to 100 participants. There is a $10 premium to run in the Competitive Wave. Everyone competing in the Competitive Wave will be subject to disqualification by race officials for arguing, fighting, cheating or yelling at course officials. An athlete cannot skip an obstacle unless directed by a staff member. Skipping an obstacle or cutting the course without permission will result in an immediate disqualification. All decisions by the Mighty Mud Dash staff are final and are not up for debate. Athletes are allowed an unlimited amount of opportunities to conquer an obstacle from the start of the obstacle. ALL NUMBERS MUST BE WRITTEN ON YOUR BODY. • The award ceremony will be held shortly after the competitive wave. Entry into the Competitive Wave will include a chip timer. Chip timing is NOT included in the race package with a regular registration. Chip Timers are available for Saturday ONLY and can be added as an add-on for $5. Competitive Wave participants have chip timers included in their registration. Be sure to bring your waiver! In order to pick-up someone else’s packet you will need 1) a copy or photo (on a phone is fine) of their driver’s license and 2) a waiver signed by the individual. Without these items, you WILL NOT be able to pick-up someone else’s packet. After you sign up, you will receive a confirmation email with your registration information including the date and time you’ll be running. Racers under 18 will need their waiver signed by their parent or guardian. Anyone under 14 by the day of the event will not be permitted into running in the race. Furthermore, Racers will need a valid photo ID to pick up their packet and bib the day of the event. Please check in at the Info Pick-Up tent 1 hour to 30 minutes before your wave time begins to pick up your bib number, check in your bags, receive your free t-shirt, and free beer ticket for runners over 21. Arriving early will give you time to stretch and make your way to the start line and cheer on friends and family who ran before you. Athletic shoes & clothes that you’re willing to get muddy. Gloves, some of the obstacles will require a lot of grips. Extra money for parking (Parking is $15), beer, food, and apparel. A camera to help capture all the Mud-filled mayhem you can post to our Facebook Page! Food Trucks – Become a food vendor here! Sponsors – Become a sponsor here! Corporate Teams – Create a corporate team here! -Please note that the course is subject to change. -Parking is $15 on event day. In the Mighty Mud Dash course you can expect to tackle 3 miles of tough obstacle racing hitting anywhere from 20-24 obstacles. You can Watch the video to see some of our past obstacles in action or view an unofficial list of obstacles listed in no particular order below. Please note obstacles are subject to change if deemed necessary by the race directors. Tube Tunnels – Claustrophobics beware! Crawl your way through a long, dark, and muddy tube that goes through a mound of mud. Fenced In – Crawl under one of the several trenches that are three feet wide, ten feet long and two and a half ft deep, covered with fence panels and filled with about a foot of water. The best way to complete this obstacle is to go backward and pull yourself under the fence panels. Dark Knight – Multiple covered trenches cut three feet wide and twenty feet long. Are you afraid of the dark? Muddy Mayhem – Try to keep your balance through the deep mud and puddles of this stretch of track as you escape the first part of the forest trail. Life’s A Ditch – Walk through one of the several long trenches filled with muddy water. Each trench will have an uneven floor pattern that you will have to feel your way through as you move along. Mud Moguls – A stretch of several mounds of dirt with two feet of water in between each mound. Due to the water, mud, and steep angle of the slippery hills, it becomes tough to get up and over them by yourself alone. Having the right shoes on can also lend you a potential advantage. Ringmaster – Our most difficult obstacle to complete is composed of multiple yellow rings hung on a tall metal truss frame. Swing your way from the ring to ring and make it across what is truly a challenging obstacle. Ensure that you have gloves or grippy hands if you want to make it through this one. Truss Rope Skidmark – Crawl under a chain link fence laying inches above the damp, muddy ground. Trying to navigate and escape the net will be a struggle on its own. Bear Crawls – How low can you go? Crawl under a series of wires laying nearly 2 feet above the ground. Small Walls – A vertical 12-foot-high wall composed of cargo nets you must climb over. Bell Ring – Climb to the top of a 18-ft tall truss system via vertical ropes and ring the bell to complete this obstacle. It will be hard to get a grip on the slippery mud-covered ropes – a real challenge for competitive wave runners! Weighted Rope Pull – Pull on one of several ropes to raise a heavy sandbag to reach and hit the bell at the end of the rope. Rope to Rope – Climb on 12 feet of horizontally placed ropes. This is an incredibly tiring obstacle, so the key here is to find the most efficient way to utilize all your limbs to climb across. Tarzan 2.0 – New for 2017, this is a series of suspended wooden walls you must climb across, followed by several suspended poles you must climb to hit the bell at the end of the obstacle. Don’t touch the ground! Summit – Also known as the “Half Pipe,” this is a large curved wall you must run and climb to reach the peak. Ropes will be available on this obstacle to assist runners. On the other side of this obstacle is a cargo net you must carefully climb down to reach the ground safely. Sand Bag Carry – Carry a 35-pound sand bag across hundreds of feet of track. One bag carry is required for each competitive wave runner – but if you really feel like challenging yourself, try carrying two at once! Mighty Wall – Climb over, and down a large 45-degree slanted wall with ropes. Use whatever stamina you have left to make it up and down a series of muddy, slippery steps. Grab a hold, and hold on tight! A-Frame Cargo Net – A flagship obstacle, this colossal 25-foot-tall cargo net obstacle places two nets angled at 45 degrees each. Carefully climb then down the slopes of this triangular metal mountain. * Obstacles are subject to change without notice. **Please note that there are no additional packet pickup events scheduled for this race. You can pick up your packet on race day April 9th, 2017 beginning at 8:00 AM. We HIGHLY recommend that you pick-up your packet at our Packet Pick-Up before the event. This will allow you to skip the 1-2 hour long check-in lines on race-day and mosey right on over to the start! 2) a waiver signed by the individual. Without these items, you WILL NOT be able to pick-up someone else’s packet. Boot Campaign is our official Charity partner. Boot Campaign was established in 2009, Boot Campaign began as a photo project and quickly evolved into a more proactive way for Americans to show their patriotism. Charitable donations were gathered and made through a donor advised fund until 2011, when Boot Campaign became a 501(c)(3) charitable organization.Boot Campaign is dedicated to promoting patriotism for America and our military community; raising awareness of the unique challenges service members face during and post-service; and providing assistance to military personnel, past and present, and their families. Retail sales of combat boots, apparel and mission-focused merchandise, general public donations and corporate sponsorships fund programs that support military families. These efforts extend to all generations of military personnel who endure significant physical, emotional and circumstantial hardships resulting from their service and sacrifice. **All Volunteers get FREE entry into the race! Not a member of a group or organization, but have some mad skills when it comes to helping out? Wanna meet some cool people and help the worthy causes of others? This is the chance for you to match your skill with an area of need in volunteering at Mighty Mud Dash. Or do you have a need to snap up CSH (community service hours) and don’t like the same old boring chores? Mighty Mud Dash is your event! What organization doesn’t need to raise money? Does your nonprofit, posse or club have 25 or more members and are looking for a quick, easy and fun way to raise some cash? We got your hook up here at Mighty Mud Dash!! 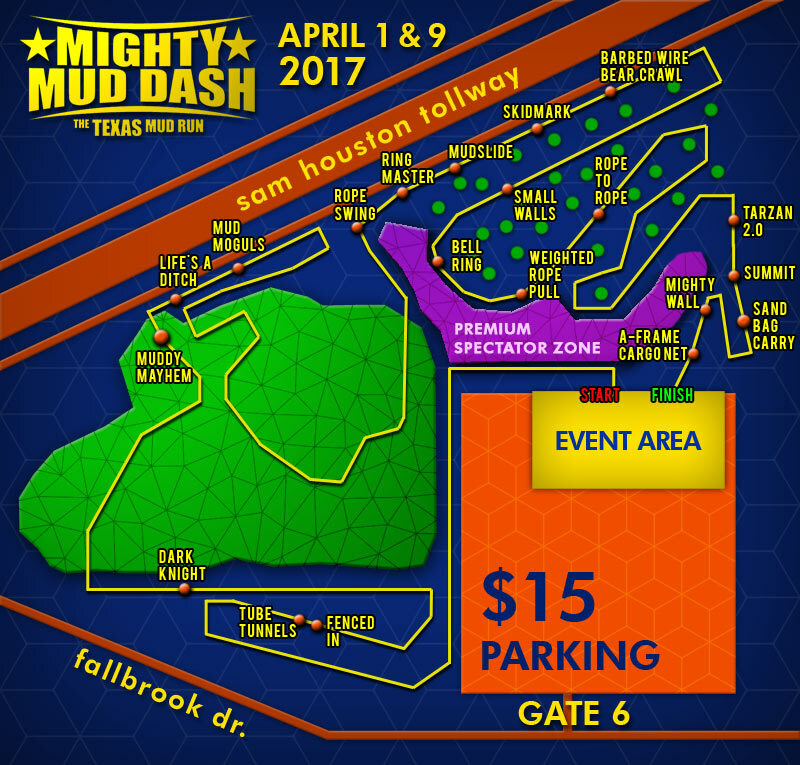 Mighty Mud Dash offers you a Mighty good deal! Qualifying organizations that bring a minimum of 25 or more members to volunteer at BOTH event days and can receive up a $1,000 donation to their organization. Simply fill out the Fundraising Application form below and send it to fundraising@mightymuddash.com for your group to be considered!